Dairee Delite – A 50's style ice cream shop. Serving Brantford for over 60 years! Dairee Delite has served ice cream treats for more than 60 years. 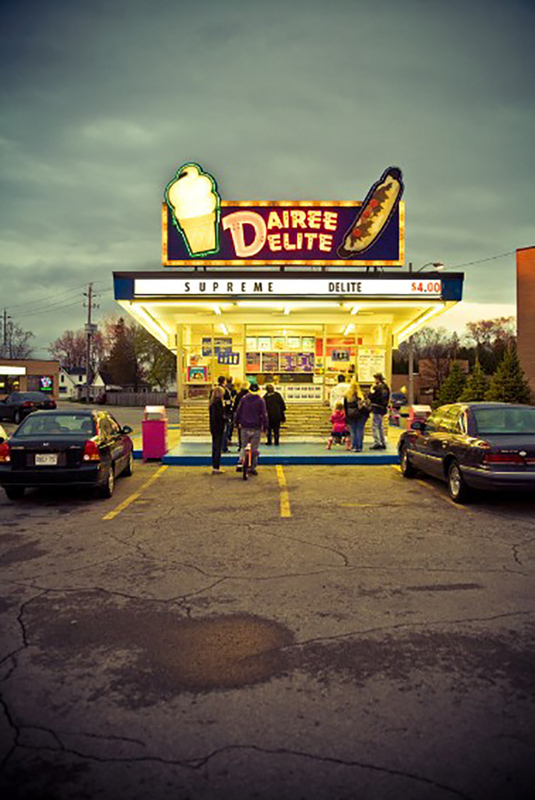 From ice cream cones to banana splits, strawberry shortcakes to frozen cakes, Dairee Delite is a must-visit landmark in Brantford, ON. The original ice cream stand – known as Koster’s Cream-EEE-Freeze – was built in 1953, and was located on Brant Ave at Bedford St until 1965. In 1965, the ice-cream stand was moved next to King George Road, setting up shop in the Brantford Mall parking lot, and changing names to the current Dairee Delite. As the story goes, the ice cream stand was offered as part of a poker game where it changed hands not once, but twice. The second time it changed hands, the winner had the stand moved from the Brantford Mall parking lot to its current location in the Home Hardware plaza on St. Paul Avenue. Stop by and see why people from all over make a visit to Dairee Delite a family tradition. 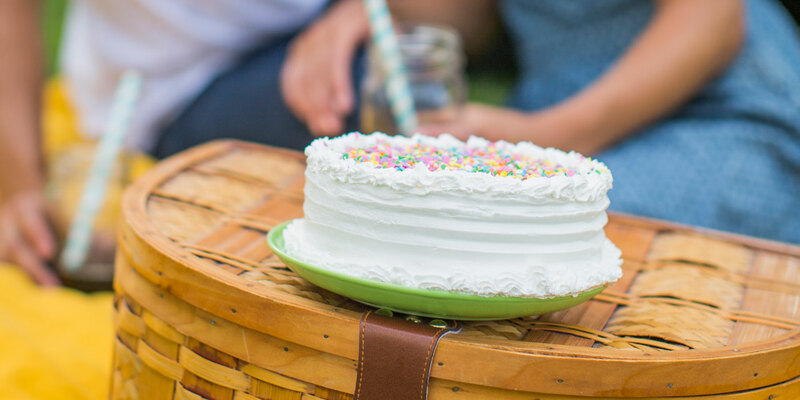 We’ve made ordering our frozen ice cream cakes even easier. Visit us at 10 King George Road (Home Hardware Plaza) for current prices. 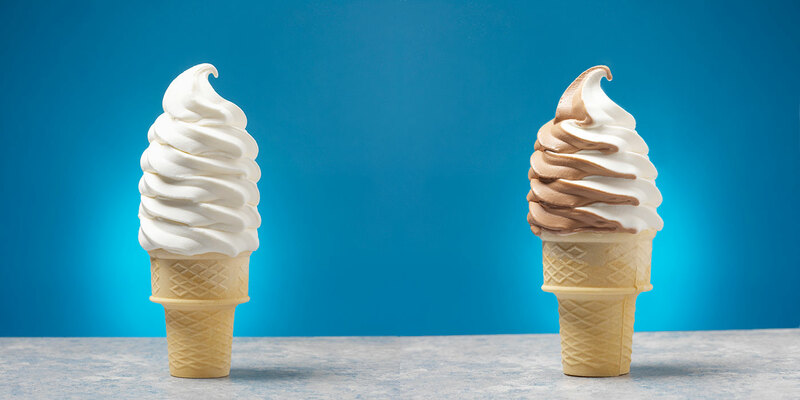 Your choice of Chocolate, Vanilla, or Twist soft ice cream. 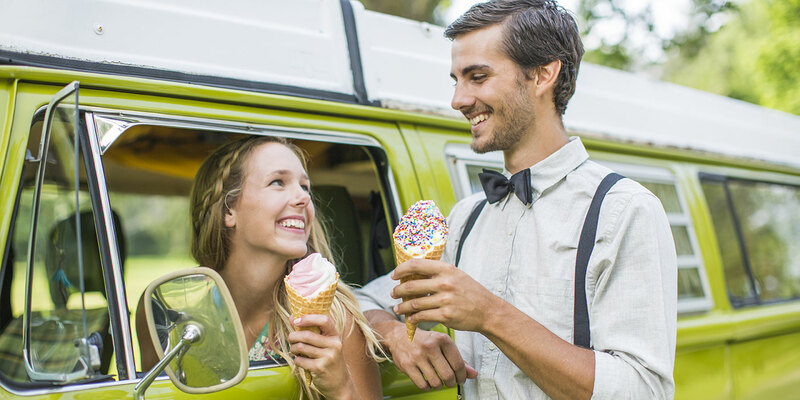 Dip your ice cream in one of our great dip flavours: chocolate, butterscotch, peanut butter, blue raspberry, cherry, coconut, cake batter, cotton candy, white chocolate. Your choice of strawberry, vanilla, or twist frozen yogurt. WAFFLE CONE also available (upcharge). Many toppings to choose from including chocolate, butterscotch, cherry, strawberry, pineapple, maple, mint, marshmallow, banana, raspberry, blueberry, chai, coffee, peanut butter, hot fudge, hot caramel! Our pies are made in a graham crust with frozen yogurt, blended into a flurry with your choice of candy bar or fruit flavour. Pies serve 6-8 people and require a minimum of 48 hours notice to custom make. Available in a wide variety of flavours including chocolate, peanut butter, mint, strawberry, pineapple, butterscotch, banana, and many more! Our creamy vanilla ice cream floating in your choice of pop: Coke, Sprite, Rootbeer, Orange, Cream Soda, Grape, Diet Coke, Gingerale. Made with frozen yogurt and your choice of fruit juice. Like a smoothie, but made with ice cream (instead of yogurt). Your choice of fruit juice, strawberry, mixed berry, peach, grape, orange, pink lemonade, blueberry watermelon, raspberry kiwi. Available in Child Size and Regular. Flavours include blue raspberry, lemon lime, grape, watermelon, banana, cotton candy, cherry, rootbeer, iced tea, orange, pineapple, strawberry. Our ice cream floating in a cool slush, available in all slush flavours! Our delicious ice cream or yogurt combined with your choice of candy bar or fruit toppings, blended up in a milkshake cup but still thick enough to eat with a spoon. Try it with Oreo, Crispy Crunch, Smarties, Peanut Butter Cups, S’mores, Banana split, turtlette, chocolate covered pretzels, tutti fruiti, cupcakes, cheesecake, Butterfinger, Twix, Skor, Reese’s Pieces, Nerds! Our specialties! All topped with real whipped cream and a sweet maraschino cherry. Three mounds of ice cream topped with chocolate, pineapple, and strawberry topping and nuts on a whole banana. Two mounds of ice cream and two brownies smothered in hot fudge and nuts. Two mounds of ice cream, one smothered in hot fudge, one with hot caramel, topped with your choice of nuts (pecans, peanuts, walnuts). Two mounds of ice cream smothered in peanut butter sauce, mini peanut butter cups, and Reese’s Pieces. A large parfait cup layered with vanilla ice cream and pineapple, strawberry, butterscotch and chocolate sauce. Topped with two wafer cookies and sprinkles. A large parfait cup layered with vanilla ice cream, hot caramel and pecans. Topped with mini turtles. A large parfait cup layered with twist ice cream, whole peanuts, and hot fudge. A shortcake loaded with vanilla ice cream and covered in strawberries. Available year round and made with fresh, local berries when in season. Two mounds of ice cream, a swiss roll, topped with chocolate dip and cherries. A regular sized parfait cup filled with vanilla ice cream, topped with marshmallow sauce (or chocolate, if you specify) and topped with your choice of either crushed Oreos, Smarties or Reese’s Pieces. A regular sized parfait cup filled with chocolate ice cream, topped with chocolate dip, peanut butter sauce, and finished with mini peanut butter cups. A regular sized parfait cup filled with chocolate ice cream, topped with crushed Oreo and gummi worms. Our version of an ice cream sandwich, made with vanilla or twist ice cream between chocolate chip or double fudge cookies and rolled in chocolate chips! All prices exclude taxes, where applicable. Prices on the menu board at our location reflect the current pricing of our menu. Please note that there is a high risk of dairy cross-contamination of all products served in our shop; therefore we CAN NOT guarantee that anything we serve is dairy free. Allergy sufferers should advise their servers prior to ordering if they wish extra precautions taken. All information is verified accurate to the best of our abilities at the time of publication. Photos from the Ice Cream Dreams series courtesy of Jono & Laynie Co.
Photo of Dairee Delite at night courtesy Paul Smith at Photohouse Studio.